The freezing stage of the freeze drying process is considered the foundation to a repeatable and efficient freeze drying process. An improved freezing process has been shown to often provide a better product with a shorter primary drying time due to a better porosity structure created by the frozen ice. Freezing without controlled nucleation results in random ice crystal formation events that lead to inconsistent pore sizes in the product across the batch, resulting in longer primary drying cycles, which can ultimately affect product quality. To produce a consistent crystal structure and pore size across a batch, and from batch to batch, a method of control is required that will nucleate all of the product in the freeze dryer at the same temperature, at the same time and at the same rate. 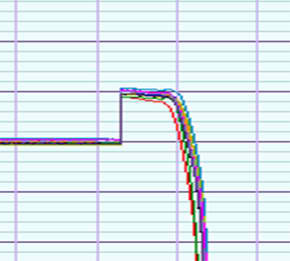 This creates a common starting point for the freezing process and creates batch uniformity. Upon nucleating the product, the first 3%-19% of available water is nucleated. EASILY RETROFIT FREEZEBOOSTER® ONTO ANY FREEZE DRYER simply by replacing the door and attaching the FreezeBooster module. Unlike other techniques, FreezeBooster does not need high positive pressures which require expensive ASME-rated pressure rated vessels. 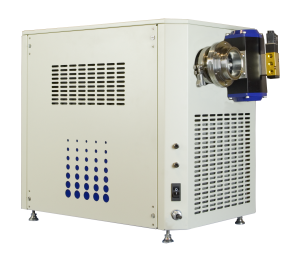 FreezeBooster has been demonstrated to work on systems as simple as laboratory style systems with clear acrylic doors and never produces a positive pressure. Combining FreezeBooster with Millrock’s AccuFlux® heat flow process monitoring and control can significantly reduce freeze drying times. Once nucleated, AccuFlux can control the freezing of the remaining 81%-97% of unfrozen water in your product. This results in a more efficient and repeatable freeze drying process. Millrock’s FreezeBooster® Nucleation Station injects ice-crystals under the optimum conditions into the product chamber to initiate nucleation throughout the entire batch. 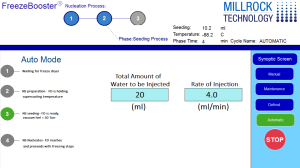 Nucleates all vials across the batch at the same time and temperature, resulting in a uniform starting point for crystal growth. One nucleation station can be used on all your freeze dryers. The nucleation station can be used on any freeze dryer brand, and is designed to be moved by one operator. The FreezeBooster process has been demonstrated to work on all types of containers, including tubes, micro-titer plates, and much more. Can be used on freeze dryers with an external or internal condenser. Designed to interface with the product chamber door and is easily retrofit to any freeze dryer. Can be sterilized via H2O2, for GMP applications. System is programmed via a PLC and has the ability for remote access for troubleshooting. No need to buy a new freeze dryer. Does not require major retrofits, control system upgrades, isolation valves, external condensers or ASME rated vessels. One nucleation station will nucleate multiple freeze dryers. Auto Mode, Step 1, Waiting for Freeze Dryer to reach nucleation step in recipe. Auto Mode, Step 2, Freeze Dryer has reached supercooling temperature. Nucleation station starts supercooling before seed generation. Auto Mode, Step 3, The Nucleation Station has reached -65C. Seed generation has started. 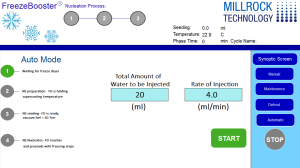 (Note: you must enter a value for the water to be injected) Once seeding is generated, the Nucleation Station sends a signal to the Freeze Dryer to lower the vacuum in the chamber. Auto Mode, Step 4, The isolation valve between the Nucleation Station and the Freeze Dryer opens. The product chamber of the Freeze Dryer is seeded with ice crystals. The Isolation Valve closes. Nucleation is complete. Millrock Technology has developed FreezeBooster® controlled nucleation technology for your freeze dryer. 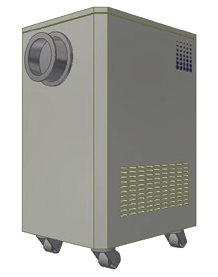 For use on laboratory style freeze dryers up to 20 sq ft. Interfaces with the product chamber door. Mounted on an adjustable height table, the NS20 version is easily moved between freeze dryers. Option for H2O2 sterilization capability. For use with production style freeze dryers from 30 sq ft to 100 sq ft. Interfaces with the product chamber door. Console style cabinet that is easily moved between freeze dryers. 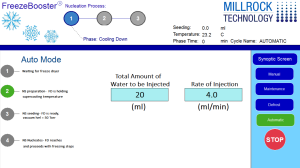 Option for H2O2 sterilization capability. For use with ASME rated production style freeze dryers from 30 sq ft to 100 sq ft. Interfaces with the product chamber via an 8” port. 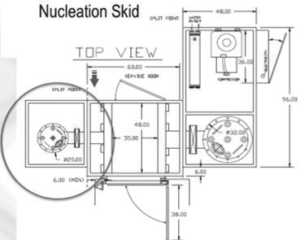 Skid style format for connection in the service alley. Steam sterilizable. Click the play button to watch FreezeBooster® in action!